Everything we currently know about the map in Realm Royale. Our Realm Royale map guide covers all of the current locations with details of Forge locations. Tips on finding some of the best loot locations are also included. 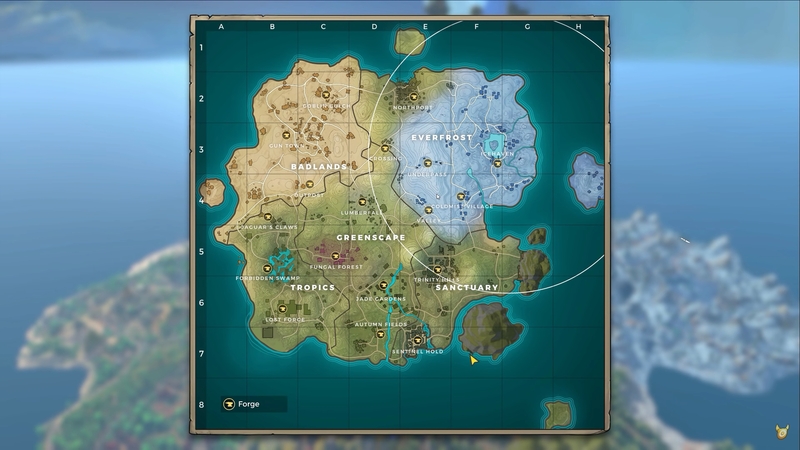 The first thing you're going to have to work out in Realm Royale - once you've chosen your starting class of course - is where you want to land on the map. It's an impressive collection of desert zones, lusher greenland areas and frosty spots, but in each one you'll be able to hoover up a tasty set of armour, weapons and abilities. It's important that you explore the area, clear out all of the goodies you want, and then make your way to the next zone in order to keep upgrading your loadout. Oh, and don't die along the way - that's really bad of course. If you're after some tips on actually choosing the best loot spots in Realm Royale, make sure you check out that article when you're done here. In the first edition of our Realm Royale map guide, we've got a snapshot of the entire playable gamespace along with a breakdown of all of the currently known locations. As we get more familiar with the game we'll be fleshing out each of these with tips for making the most out of each opportunity - and what to watch out for while you're distracted by all that shiny stuff. If you're wondering what those anvil icons are all about by the way, thesese signify the availability of a Forge. More on how those work after a breakdown of the map itself, which is comprised of zones and subzones. We've updated our map guide with all the latest locations and also added in a few pointers on how to loot a handful of the zones. These are all great starting points for the gearing up process, so consider making them the first port of call when you leap from the blimp! Gun Town - The clue's in the name here and this is hands-down the best desert spot to pick. Not many players head towards the desert out of choice either, which provides you with some breathing space to get geared up while the rest of the pack dukes it out elsewhere. Icehaven - This is perhaps the most popular landing zone in Realm Royale right now, and you'll need to be extremely wary of other players here. Jump on your mount the moment you land and head towards the nearest building to find any weapon upgrade at all. If you can land on the frozen pond you'll find plenty of nearby houses to loot. Underpass - To access this spot you'll actually have to land to either the left or right of the massive mountain, then look for the tunnel entrance that takes you to the interior. You'll find chests galore and a Forge to start crafting with, but be ready for some serious competition if you make a beeline for this place. Lumberfall - This is an extremely popular starting area as the trees provide plenty of cover, there are towers to help you survey potential danger, and these towers are full of chests. Try to land on one of these structures, then clear out the other buildings located nearby. Jade Gardens - Although this is a pretty good landing zone, you'll need to rummage through quite a lot of smaller buildings to get your hands on a decent amount of abilities, armour and weapons. Those yellow anvils indicate the presence of a Forge, and the basic idea is that you disenchant all of the gear and abilities you don't need into a currency called Shards. These can then be added to the Forge in exchange for items like potions, armour and even Legendary weapons. Just be aware that Forges spit smoke into the air when they're used, which will make you a magnet for enemy players. You also have to wait up to a minute for the crafting process to complete, after which time the item - or items, if you're making multiple crafts - is spat out onto the floor. Other players can grab these as well as you! Check out our dedicated page on the subject for advice on how to get more Shards and spend them at the Forge. It's got all the crafting options, Shard requirements and crafting timers you need to be aware of. We'll expand on this in detail in the above sections, but make sure you thoroughly ransack a building before moving on, and coordinate with your team about what's been cleared out and where. Don't be too greedy about disenchanting stuff either. It may well be that your partner(s) can make much better use of the item a chest spits out, and it's a waste of the team's potential to just turn everything into Shards automatically. That's it for the first edition of our article dedicated to the Realm Royale map. If you need help with anything else to do with the game, do check out our core Realm Royale guide - it contains links to all of our coverage of the new Battle Royale title from Hi-Rez!